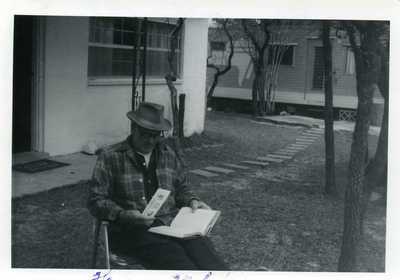 A black and white photograph of a man sitting outside reading a book. Handwriting on the back of the photograph appears to say, "February 20th 1968 Dave reading Mark Twain's adventure 1968 Dave Jackson Florida." From the Ralph J. Sawyer section of the Harris W. Soule papers.